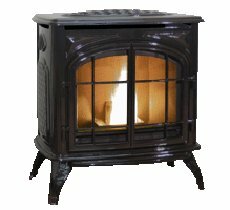 The Kozi Previa is a decorative cast iron stove styled as a traditional woodburner. Its arched doors provide a generous viewing area. It produces 40,000 btu. and is capable of heating an area of 1,800 square feet. Maximum burn time is 60 hours. The casting detail is nice on this stove, including a textured finish on the trivet and side panels. The queen anne style legs are also of cast iron. The Previa is available in a choice of casting colours and finishes. The 'MX' controller provides stove diagnostics in the form of blinking led lights to alert the user to any problems. Window Size 15.5 in. by 11 in. Unusually, the fan motors on this stove have oiling points and this is part of the regular maintenance schedule. This stove is sensitive to pellet quality and can not handle pellets with a high ash content. The air draft for combustion must be adjusted manually. The auger motor, burn pot and igniter are not covered by the warranty. Clean the heat exchanger tubes, lift top heat shield and dump ashes into burn chamber, remove and clean the burn pot, empty the ash. Clean the glass and inspect the condition of the door gasket. Clean the venting system, clean behind the rear heat shield and the exhaust passages in the stove. Clean the combustion fan and housing. Oil the circulation fan motor. If you would like to leave a review of the Kozi Previa pellet stove, please use the form on the contact page.